Finally, we have created a second compact economical solution to the installation of a front-mounted 3-way system for the general market. This incredibly flexible module will also act as a 2-way crossover. 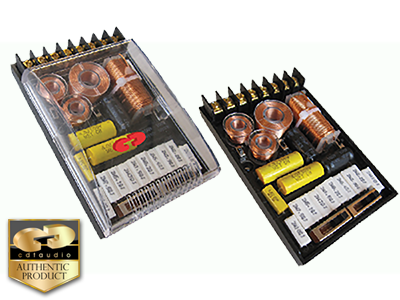 This unit is specifically oriented to the use of very small 2~3 inch midrange drivers in a three way system. This crossover module offers interactive crossover to and adjustability of the mid-range and tweeter and a switchable conventional second order or high-tech elliptic filter to cross over the tweeter. New and unprecedented functionality in this unit is highlighted by this dual-order, tweeter crossover. Designed to produce a crossover to the midrange around 1500 Hz with virtually any woofer and a two or three-inch midrange in a typical installation this crossover produces amazing results with maximum flexibility and compactness in a very tight installation. The woofer’s proprietary tapped inductor selects three different values to provide three different crossover frequencies for a range of woofers or mid-woofers. The midrange level is adjustable to six different levels to blend optimally or in case you want to crossover to the tweeter directly using a mid-woofer the midrange function can be set to the lowest level and ignored. The tweeter also has a tapped inductor to control this crossover also. This most flexible approach will produce the best sound in most installations and will implement almost any installation. Choose the mounting position and select the drivers to accommodate your vehicle and to facilitate a natural sound. A very small, extended midrange speaker can be selected to augment the tweeter response especially if a high mounting position is chosen for the tweeter. The midrange is allowed to crossover to the tweeter based on the midrange’s natural character. The MX1000SX has five multi-position switches. Referring to the unit with the connector row down the HDR-1 switch is seen to the left on the component board under the cover. The chart page below shows the effect of the settings of this switch from LO to HI. This controls the woofer crossover as shown. The next switch is labeled HDR-2 and is in the upper left corner of the board. It has six positions which control the midrange level as shown. The far left switch position is the bottom curve – maximum attenuation. The next switch is labeled HDR-3 in the upper right corner and it controls the tweeter level. This level is modified by the order switch 2ND or 5th in the right hand side of the approximate center of the board and by the TW EQ switch on the lower right. The TW EQ switch changes the value of an inductor which alters the response shape as shown in the graphs. The small midrange drivers used in this system require minimal enclosure volume and can be located in the most densely occupied locations. Installation of this unit is an adventure in a world of possibilities and custom control. The following charts show what you can do with this device and these functions can be used singly or combined. The EQ can be low for a flatter frequency response or high for a flatter power response. This depends on where the tweeters are mounted. EQ set to high accommodates indirectly aimed mountings. It is possible to use the crossover without some drivers connected. Always set the HDR switch for the unused driver(s) to LO (or all the way to the left for HDR-2) in that case. Omitting the woofer will place an extra 4 Ohm load on the amp over a narrow frequency band around 1kHz. Omitting the woofer is the least desirable omission of the three possible. A small extra load will be placed on the amp over a limited frequency range in the other cases.